*Note: Quality, canned tomatoes are perfect for this recipe; however, if you have fresh, ultra-ripe tomatoes, use 2 lbs. 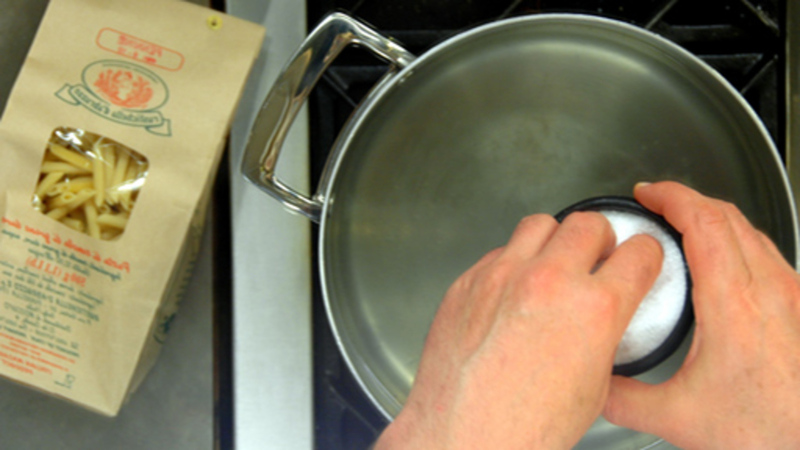 To start, drain the tomatoes and pass them through a passatutto or a food mill (use the smallest disc). Finely dice the onion and mince the garlic. 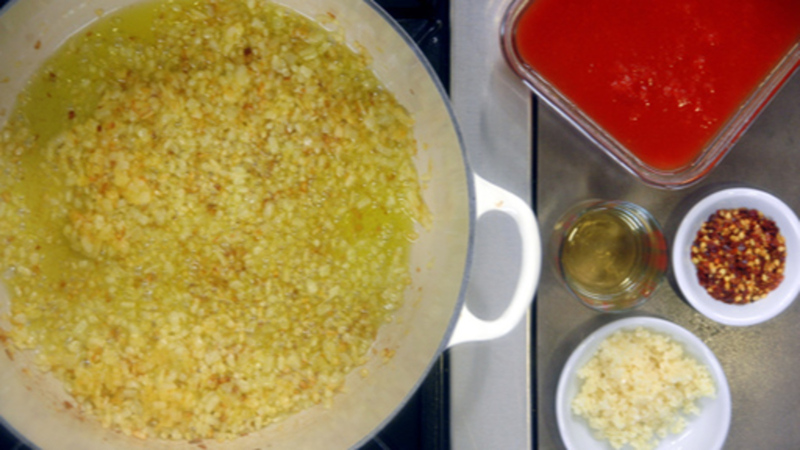 To make the sauce, heat a large sauce pan or pot over medium-high heat. Add the olive oil, followed by the onions. Sauté the onions for about 10 minutes or until they begin to caramelize a bit. Then turn the heat down slightly and add the garlic and chili flakes. Cook for a minute or so, just until the garlic becomes fragrant. Next, deglaze with the white wine and let it reduce until it is almost dry. Next, add the tomatoes and a pinch of salt. Let the sauce simmer for about 30 minutes or so. Stir occasionally to prevent it from scorching. Meanwhile, bring a large pot of water to a boil and proceed to the next step. 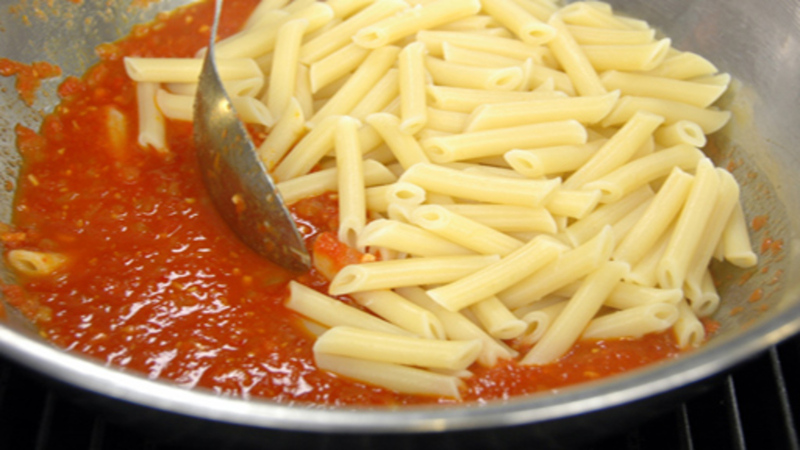 When ready to cook the pasta, add 1 tsp of salt per litre/quart of water and then add the pasta. Cook the pasta according to the package. Once done, reserve 1 cup of the cooking liquid and then drain the pasta. To finish the dish, taste the sauce for seasoning. Combine the pasta with just enough sauce to liberally coat it. If the sauce seems too thick, add a bit of the reserved cooking water to thin it out. Serve the pasta in warmed bowls and top with freshly chopped parsley and/or basil and Plant-Based Parmesan, if desired. I would remove the seeds from the tomatoes by hand first. Then pulse the tomatoes very briefly in the vitamix just to break them up slightly. A vitamix is super powerful and if you blend the tomatoes too much, they will turn a light pink color. You do not have to strain the pulp - this is part of the sauce! Cheers! Hi, Do you add the juice from the canned tomatoes, or leave this out? We leave the juice out (you can freeze it for another use) and only use the pulp because it makes the sauce thicker. You can add the juice, but it will thin out the sauce. Cheers! This sounds yummy - we both like spice. 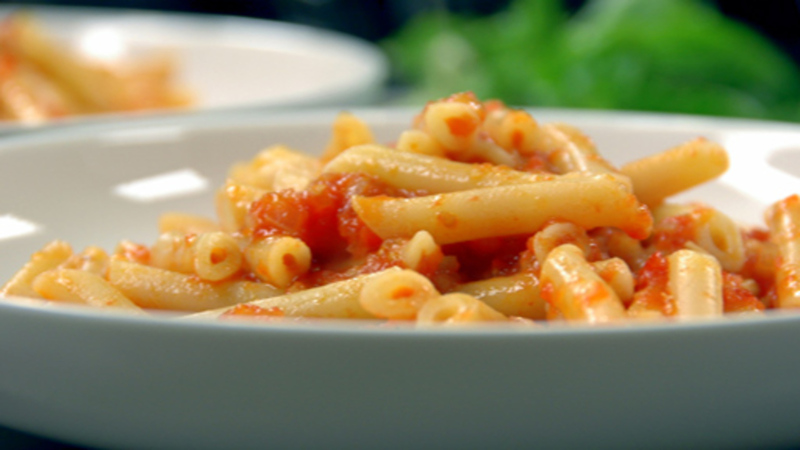 I have a good supply of Rouxbe's Tomato Sauce in my freezer, made with San Marzano tomatoes. How much of it would I substitute for the canned tomatoes, given that the tomatoes are drained? Lately, I've been finishing my pasta dishes in the oven with a bit of parmesan and panko sprinkled on top - I might give it a try with this one. I would say about 2/3 of the can consists of the tomatoes and about 1/3 is the juice/puree. So, I would use about 40 ounces (5 cups) sauce total - it doesn't have to be exact. The one thing to keep in mind here though is the sauce may be a bit more "oniony" just because you first cook the onions to a golden stage and then there are onions already in your tomato sauce. I'm sure it will work but just keep this in mind. Cheers! I just made another batch of this and I have to say, every time I go to add the 1 tablespoon of chili flakes I think "really, that seems like so much" but then I go ahead and do it anyway, since I was the one that wrote the recipe, I figure I can trust it :-) I have to say, it is spicy, but I like it. That is the whole point of this sauce, it's angry! Don't get me wrong, it's not too over the top, but it definitely has some kick to it. Of course, if you don't like things very spicy, then you could always decrease the amount of chili flakes, but I do encourage you to try it at least once with the full tablespoon to see how you like it. Cheers! If I double the recipe, do I double the chili flakes also? Scary! Normally, it's great with 1 tbsp.